SUDEM is an accurate, high resolution digital model or 3-D representation of South Africa’s entire terrain. Environmental managers, engineers, geographical information science practitioners, remote sensors, geographers, geologists, telecommunication companies. SUDEM combines various sources of elevation data to produce a single accurate, high-resolution DEM covering the entire terrain of South Africa. Preference is given to data of large scale (i.e. 1:10000) contours and spot heights, while smaller scale (i.e. 1:50000) data are only used in areas where large scale data are unavailable. By using a combination of algorithms, an intermediate DEM is produced by interpolating a high-resolution DEM from contours and spot heights of the various data sources. The intermediate DEM detects and corrects even the slightest of errors in the data, such as errors in the digitized contours and spot heights, spatial errors such as gaps and mismatching contours at the edges of map sheets, by way of an automated method. 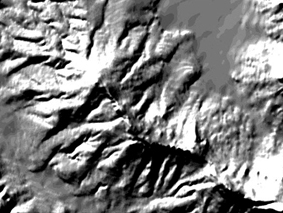 The elevation data from the different sources are fused in such a way that “edge effects” are minimized. An enhanced resolution DEM is then provided by fusing the intermediate DEM with the original DEM, the intermediate DEM having a resolution higher than the resolution of the original DEM and the fusion being carried out in a manner that the contour information of the intermediate DEM only dominates in areas where the contour density of the original DEM is significantly lower than that of the intermediate DEM. A PCT application (PCT/IB2013/05117) has been filed and it has already been licensed. The methodology is completed and tested.